Continuation of the Roads to Glasgow and Edinburgh as far asLongtown and Morpeth, with roads to Scarborough, Whitby, Sunderland, and South & North Shields. An antique map published 12th February, 1806 in "Laurie and Whittle's New Traveller's Companion". This is plate 21 and shows the 'Continuation of the Roads to Glasgow and Edinburgh as far asLongtown and Morpeth, with roads to Scarborough, Whitby, Sunderland, and South & North Shields. Continuation of the Roads to Glasgow and Edinburgh as far as Abberford and York,, with roads to Hull, (by York) and Hull, (by Lincoln) & Barton Ferry. An antique map published 12th February, 1806 in "Laurie and Whittle's New Traveller's Companion". This is plate 20 and shows the 'Continuation of the Roads to Glasgow and Edinburgh as far as Abberford and York,, with roads to Hull, (by York) and Hull, (by Lincoln) & Barton Ferry. Some overall foxing. Completion of the Roads to Holyhead, with roads to Barmouth, Harlech, Newin, Beaumaris & Amlwch Port. An antique map published 12th February, 1806 in "Laurie and Whittle's New Traveller's Companion". 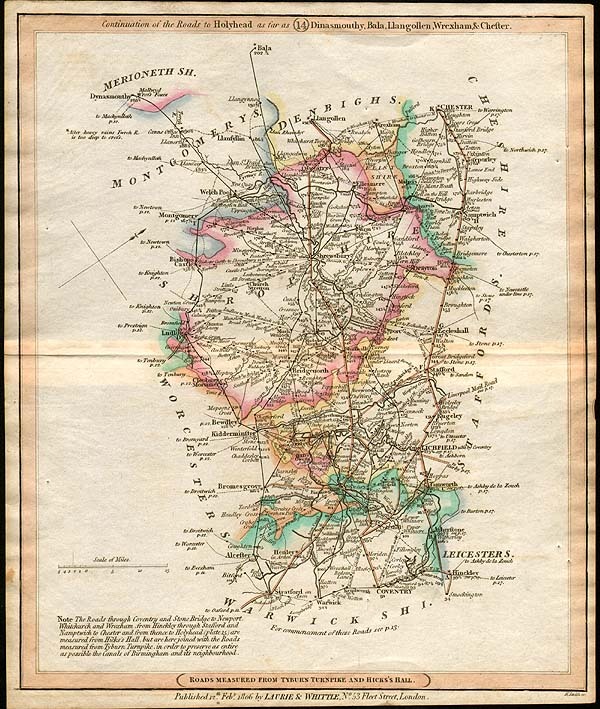 This is plate 15 and shows the 'Completion of the Roads to Holyhead, with roads to Barmouth, Harlech, Newin, Beaumaris & Amlwch Port.' Some foxing. Continuation of the Roads to Lands End as far as Exeter with Roads to Christchurch, Poole, Weymouth, Lyme, Topsham, South Molton and Porlock. An antique map published in 1812 in "Laurie and Whittle's New Traveller's Companion". This is plate 6 and shows the "Continuation o0f the Roads to Lands End as far as Exeter with Roads to Christchurch, Poole, Weymouth, Lyme, Topsham, South Molton and Porloch.) " Original outline colour. Some foxing and offsetting. Completion of the Road to the Lands End with roads to Dartmouth, Plymouth, Fowey, Falmouth, Padstow, Biddeford and Barnstable. An antique map published in 1812 in "Laurie and Whittle's New Traveller's Companion". This is plate 7 and shows the "Completion of the Road to the Lands End with roads to Dartmouth, Plymouth, Fowey, Falmouth, Padstow, Biddeford and Barnstable." Original outline colour. Some foxing and offsetting. An antique map published in 1812 in "Laurie and Whittle's New Traveller's Companion". This is plate 3 and shows the "Commencement of the Roads to Bath and Bristol, as far as Devizes and Chippenham with roads to Malmsbury, Cirencester, Oxford & Glocester (by Henley). " Original outline colour. Some foxing and offsetting. Continuation of the Roads to Holyhead as far as Dinasmouthy, Bala, Llangollen, Wrexham & Chester. An antique map published in 1812 in "Laurie and Whittle's New Traveller's Companion". 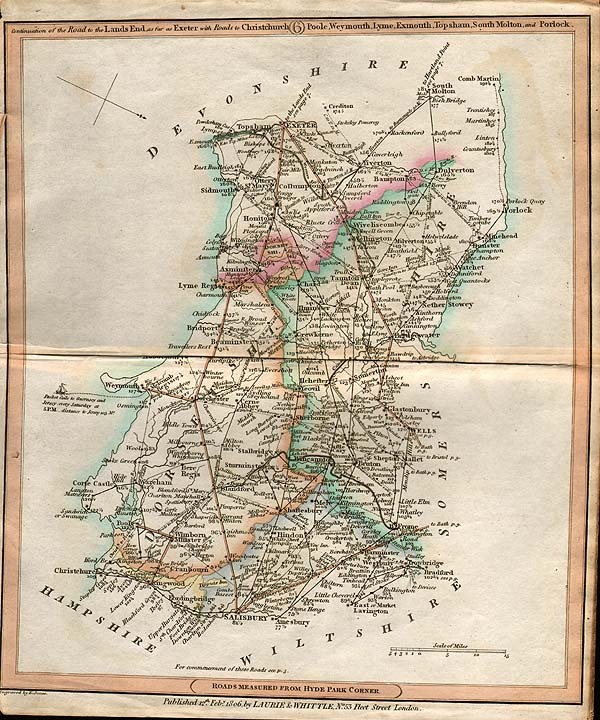 This is plate 14 and shows the "Continuation of the Roads to Holyhead as far as Dinasmouthy, Bala, Llangollen, Wrexham & Chester." Original outline colour. Some foxing and offsetting. An antique map published 12th February, 1806 in "Laurie and Whittle's New Traveller's Companion". This is plate 15 and shows the 'Completion of the Roads to Holyhead, with roads to Barmouth, Harlech, Newin, Beaumaris & Amlwch Port.' Some foxing and some offsetting..
Commencement of the Roads to Aberystwith as far as Glocester, Tewkesbury and Worcester, with roads to Campden and Startfprd on Avon. An antique map published in 1812 in "Laurie and Whittle's New Traveller's Companion". This is plate 11 and shows the "Commencement of the Roads to Aberystwith as far as Glocester, Tewkesbury and Worcester, with roads to Campden and Startfprd on Avon." Original outline colour. Some foxing and offsetting. Roads to Newmarket, Bury St Edmunds, Norwich, Ipswich, Harwich, Yarmouth &c.
An antique map published in 1812 in "Laurie and Whittle's New Traveller's Companion". 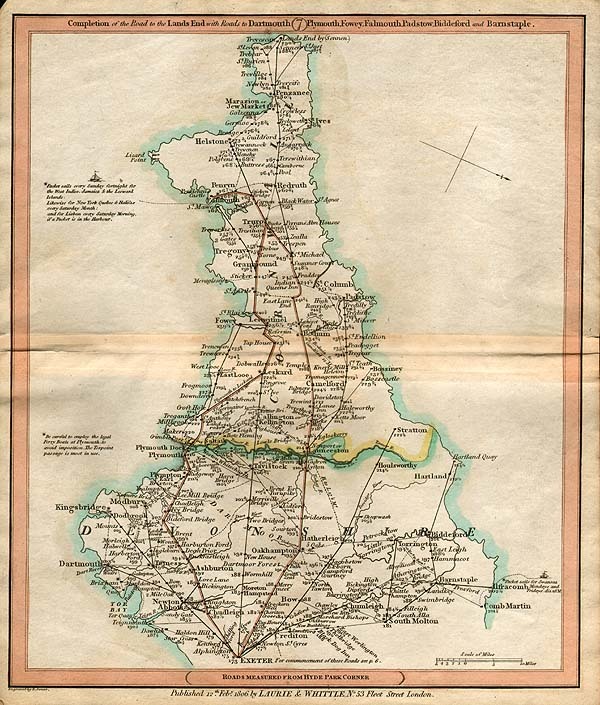 This is plate 24 and shows the "Roads to Newmarket, Bury St Edmunds, Norwich, Ipswich, Harwich, Yarmouth &c." Original outline colour. Some foxing and offsetting. Commencement of the Road to Edinburgh (by Ware) with Roads to Cambridge, Wisbeach, Lynn, Burnham Market and Wells. An antique map published in 1812 in "Laurie and Whittle's New Traveller's Companion". This is plate 23 and shows the "Commencement of the Road to Edinburgh (by Ware) with Roads to Cambridge, Wisbeach, Lynn, Burnham Market and Wells.) " Original outline colour. Some foxing and offsetting. Commencement of the Roads to Glasgow and Edinburgh as far as Stamford, with roads to Uppingham & Market Deeping. An antique map published in 1812 in "Laurie and Whittle's New Traveller's Companion". This is plate 19 and shows the "Commencement of the Roads to Glasgow and Edinburgh as far as Stamford, with roads to Uppingham & Market Deeping.) " Original outline colour. Some foxing and offsetting. Continuation of the Roads to Glasgow and Edinburgh as far as Abberford and York with Roads to Hull (by York) and Hull (by Lincoln) & Barton Ferry. An antique map published in 1812 in "Laurie and Whittle's New Traveller's Companion". 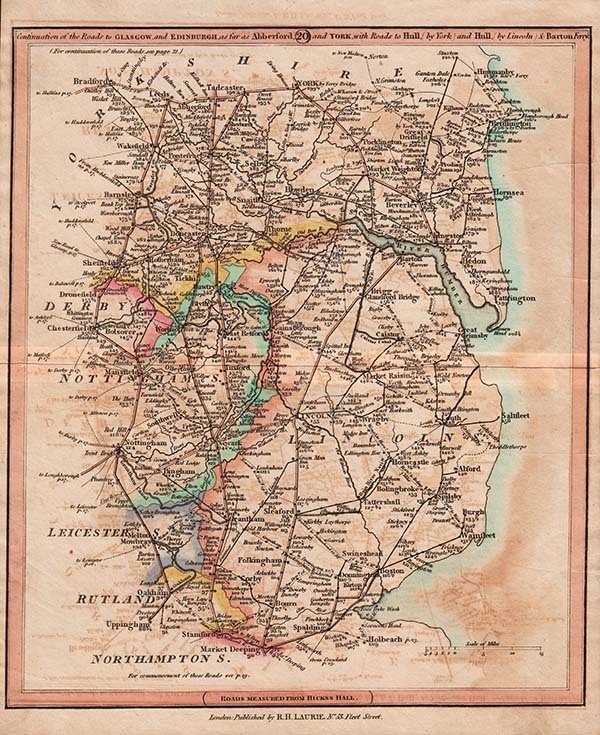 This is plate 20 and shows the "Continuation of the Roads to Glasgow and Edinburgh as far as Abberford and York with Roads to Hull (by York) and Hull (by Lincoln) & Barton Ferry.) " Original outline colour. Some foxing and offsetting. Completion of the Roads to Glasgow, by Moffat & Dumfries, & the respective roads to Edinburgh by Carlisle, Jedburgh, Kelso. Coldstream and Berwick. An antique map published in 1812 in "Laurie and Whittle's New Traveller's Companion". 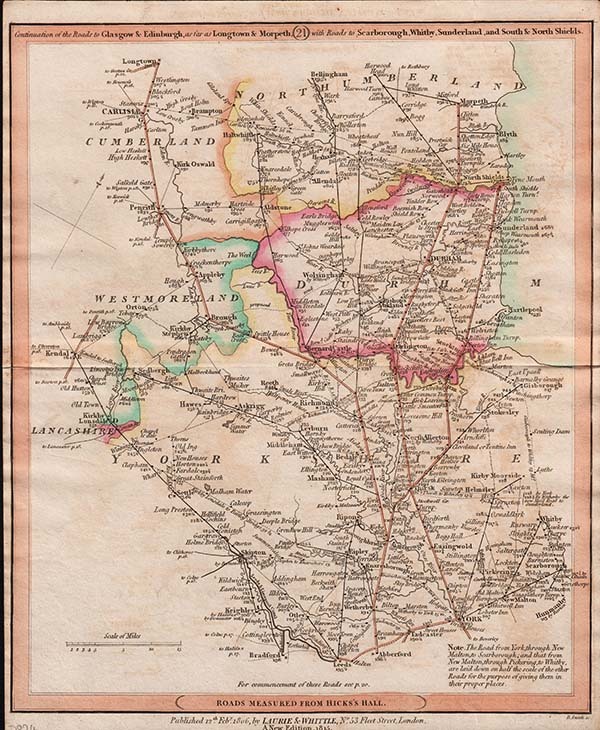 This is plate 22 and shows the "Completion of the Roads to Glasgow, by Moffat & Dumfries, & the respective roads to Edinburgh by Carlisle, Jedburgh, Kelso. Coldstream and Berwick.) " Original outline colour. Some foxing and offsetting. Completion of the Roads to Greenock, Irvine and Ayr, with Roads to Castle Douglas, Kirkcudbright, Newton Stewart, Wigton & Port Patrick. An antique map published in 1812 in "Laurie and Whittle's New Traveller's Companion". This is plate 25 and shows the "Completion of the Roads to Greenock, Irvine and Ayr, with Roads to Castle Douglas, Kirkcudbright, Newton Stewart, Wigton & Port Patrick.) " Original outline colour. Some foxing and offsetting. Commencement of the Roads to Holyhead as far as Stratford on Avon, Warwick, Coventry & Hinckley. An antique map published in 1812 in "Laurie and Whittle's New Traveller's Companion". This is plate 13 and shows the "Commencement of the Roads to Holyhead as far as Stratford on Avon, Warwick, Coventry & Hinckley.) " Original outline colour. Some foxing and offsetting. An antique map published in 1812 in "Laurie and Whittle's New Traveller's Companion". This is plate 18 and shows the "Completion of the Roads to the Lakes, with Roads to Whitehaven, Workington, Maryport and Carlisle (by Lancaster) .) " Original outline colour. Some foxing and offsetting. An antique map published in 1812 in "Laurie and Whittle's New Traveller's Companion". This is plate 2 and shows the "Roads to Eastbourne (by Uckfield) Brighthelmstone, Shoreham, Worthing, Little Hampton and Bognor (by Arundel).) " Original outline colour. Some foxing and offsetting. Commencement of the Roads to the Lands End as far as Salisbury with Roads to Gosport, Southampton, Lymington, Christchurch, Winchester, Ringwood, E. Lavington, and Devizes. An antique map published in 1812 in "Laurie and Whittle's New Traveller's Companion". This is plate 5 and shows the "Commencement of the Roads to the Lands End as far as Salisbury with Roads to Gosport, Southampton, Lymington, Christchurch, Winchester, Ringwood, E. Lavington, and Devizes.) " Original outline colour. Some foxing and offsetting. An antique map published in 1812 in "Laurie and Whittle's New Traveller's Companion". 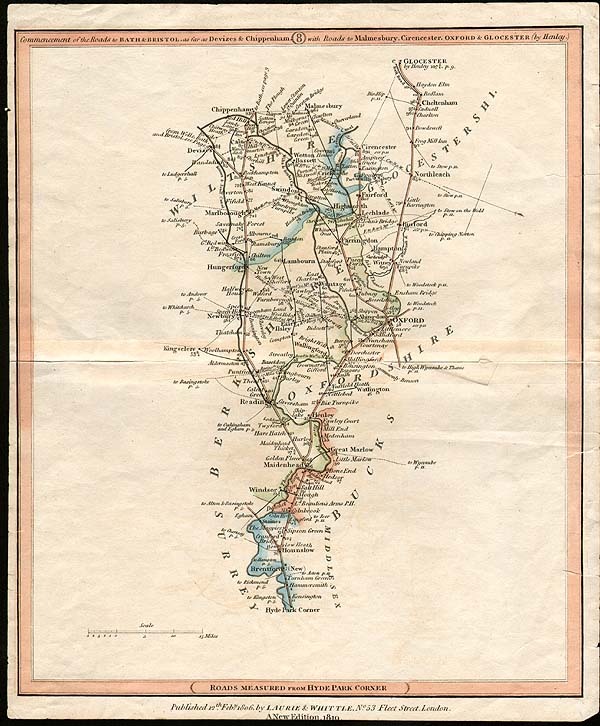 This is plate 3 and shows the "Roads to Arundel, Bognor, (by Petworth) Chichester and Portsmouth." Original outline colour. Some foxing and offsetting. Continuation of the Roads to the Lakes, with Roads to Chester, Liverpool, Manchester. An antique map published in 1812 in "Laurie and Whittle's New Traveller's Companion". This is plate 17 and shows the "Laurie & Whittle - Continuation of the Roads to the Lakes, with Roads to Chester, Liverpool, Manchester." Original outline colour. Some foxing and offsetting. Commencement of the roads to the Lakes of Lancaster, Westmorland & Cumberland, as far as Hinkley and Leicester. An antique map published in 1812 in "Laurie and Whittle's New Traveller's Companion". This is plate 16 and shows the "Laurie & Whittle - Commencement of the roads to the Lakes of Lancaster, Westmorland & Cumberland, as far as Hinkley and Leicester". Original outline colour. Some foxing and offsetting. Completion of the Roads to Milford Haven with roads to Tenby, Pembroke, St. David's and Cardigan. An antique map published in 1812 in "Laurie and Whittle's New Traveller's Companion". This is plate 10 and shows the "Completion of the Roads to Milford Haven with roads to Tenby, Pembroke, St. David's and Cardigan". Original outline colour. Some foxing and offsetting. Commencement of the Roads to the Lakes of Lancaster, Westmorland and Cumberland, as far as Hinkley & Leicester. An antique map by Laurie and Whittle entitled "Commencement of the Roads to the Lakes of Lancaster, Westmorland and Cumberland, as far as Hinkley & Leicester." Road commences at Hicks's Hill, Middlesex. Published in their "New Travellers Companion" in 1812. Original colouring. Some foxing and offsetting.